2014 Black Friday deals, with low prices and sales on Motors and Racing Parts and more. 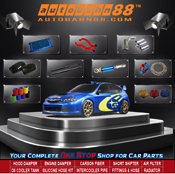 Promotion valid only on 28th and 1st December!Choose your car parts now! Read more at http://autobahn88-uk.com/ Read more.. Type : Bonnet Damper / Hood Damper Application : Nissan Skyline GTR R32 ( 89-94 ), RB26 Colour : Black Note : ROHS Approval What is included : 2 x Damper 1 x Mounting Set (As seem in the photos, Serration ... Read more.. Type Short Throw Shifter Applications Porsche 911 996 Boxster Material High Quality Steel Specification Roller Bearings For Long Lasting Hard Driving. Designed for Motorsport use. This Will Reduce Throw up to 40% and Give you a Faster Shift Throw ... Read more.. Type Short Throw Shifter Applications BMW E30 E36 E39 E46 Material High Quality Steel Specification Roller Bearings For Long Lasting Hard Driving. Designed for Motorsport use. This Will Reduce Throw up to 40% and Give you a Faster Shift ... Read more.. 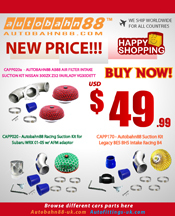 Early Bird Christmas Sale on Autobahn88-uk.com from 15th Nov to 20th Dec.With up to 25% discount in Bonnet Damper , What are you waiting for? Hurry up to buy now!Acura /Benz /Chevrolet ... Read more.. Type Straight Aluminum Pipe Size 70mm / 2.75″ , Outer Diameter , 2mm wall thickness Material Aluminum, Shine Polished , Mandrel Bending Length Total : 300mm / 11.75″ Angle Straight Application Good for Intercooler custom piping , Turbo Intake Pipe, Air Intake Pipe, Custom Air ... Read more.. Type: Silicone Radiator Hose Kit Color Option: Blue / Red / Black Material: Silicone Application: Toyota Vits Yaris NCP91 Year: 2007 Description: Accept higher pressure than the original The temperature change will not affect the shape and the flow rate. Not Easy to ... Read more.. Type: Silicone Radiator Hose Kit Color Option: Blue / Red / Black Material: Silicone Application: Mitsubishi Lancer 1.6 4G18 Year: 2000-2007 Description: Accept higher pressure than the original The temperature change will not affect the shape and the flow rate. Not Easy to ... Read more.. Type 45 Degree Aluminum Pipe Size 51mm / 2″ , Outer Diameter , 2mm wall thickness Material Aluminum, Shine Polished , Mandrel Bending Length Total : 300mm / 11.75″ Angle 45 Degree Application Good for Intercooler custom piping , Turbo Intake Pipe, Air Intake ... Read more..